The Iraqi loan Affair which began on the 16th of November 1975 was the final nail in the coffin for Gough Whitlam as the first ALP Prime Minister since the 1950's. Gough Whitlam continued on after the Iraqi Loan Affair to lead the ALP until its defeat at the 1977 Federal election, and then Whitlam retired, and a former Queensland police sergeant, Bill Hayden led the ALP until just prior to the 1983 Federal election, when Bill Hayden was dumped and the former ACTU president, Bob Hawke was made the 'Leader' of the Opposition, in an election described by a disgruntled Bill Hayden as; 'A drover's dog could win this election', and the drover's dog did. The media was euphoric and one cartoon even depicted Bob Hawke walking on water. The ALP is again in power within the Australian Federal government, but is in a precarious position and so there must be some reason why the Sydney based newspaper, The Australian, published an article by Philip Dorling on the 19th of November 2011; “The Plot to get Gough” and then expanded that article with this article on the 21st of November 2011. If read in its proper context, this article has a prophetic message for the ALP. Whitlam, Fraser and the Iraqi Money affair made for a great story, writes Philip Dorling. It was Rupert Murdoch's biggest personal scoop as a journalista front-page splash in The Australian on February 25, 1976, revealing that the Labor leader Gough Whitlam had secretly sought an election campaign donation from Saddam Hussein's Iraqi Ba'ath Party. What was called the Iraqi Money affair was a political sensation that nearly cost Whitlam the Labor leadership in circumstances of absolute political humiliation. Yet just how Murdoch got the story has long remained a mystery. The story in The Australian. The discovery of Murdoch's personal file on the Iraqi Money affair and other records in the National Archives provides a unique insight into one of the more bizarre episodes in Australian politics. It began within a week of the Governor-General Sir John Kerr's decision on November 11, 1975, to sack Whitlam as prime minister and install Malcolm Fraser as caretaker prime minister before a double dissolution election. The Labor Party machine was desperately short of funds to fight a federal election campaign. However, on the margins of a November 16 national executive meeting, the Labor Left figure and pro-Palestinian activist Bill Hartley raised with the national secretary David Combe the possibility that Middle East sources could provide much-needed campaign funding. Combe welcomed Hartley's idea and called over Whitlam who agreed that the left-winger should explore raising campaign funds in the Middle East where Labor's "even-handed" approach to Israel and Palestine had attracted Arab praise. Hartley called on a trusted associate, a French-Australian businessman, Henri Fischer, who supported the Palestinian cause and had strong ties with Iraq. Deeply conservative and virulently anti-Semitic, Fischer was an unlikely Labor ally. However, at Hartley's instigation Whitlam and Combe called on Fischer at his Sydney Blues Point Tower apartment in the evening of November 16 and it was agreed that the businessman would act as Labor's emissary in the Middle East. Fischer flew to Baghdad and, by his own account, met senior Iraqi ministers including Saddam Hussein. In early December he returned to Australia in the company of two Iraqi officialsFarouk Al Jezirah Yeeyah and Ghafil Jassem Al-Tikritilater identified as a senior Iraqi intelligence officer and a nephew of Saddam Hussein respectively. Whitlam and Combe met the Iraqis at a breakfast meeting at Fischer's apartment on December 10, three days before the federal election. Accounts of what transpired at the meeting are disputed, although it seems clear that Whitlam spoke in general terms in support of the Arab and Palestinian cause, while the Iraqis indicated their desire for Labor's return to power. No funds changed hands at the meeting. Fischer then accompanied the Iraqis to Hong Kong to facilitate the transfer of a large donation, probably $US500,000 to an offshore account and thence to the Labor Party. At this point Fischer, whose own financial circumstances were precarious, appears to have diverted the funds to himself. He subsequently acquired a large property in California, allegedly using the stolen Iraqi funds. However, in telephone calls to both Hartley and Combe, Fischer assured his Labor contacts that the Iraqi donation would be forthcoming and Combe authorised a last burst of campaign TV advertising before Labor's December 13 election defeat. In mid-February 1976, in an apparent effort to muddy the waters and protect his own position, Fischer flew to New York and from there contacted Rupert Murdoch, then holidaying in Switzerland, with a view to spilling the story, or at least telling his version of what had transpired. After some international telephone tag, Murdoch telephoned Fischer on February 17, and later recorded an account of their conversation in his file: "[Fischer] sounded to be in a very excited state of mind. He said that I would know that there was big trouble in Australia about the Labor Party not paying its advertising account … He said that there was a major scandal about to break in Australia … He said that Mr Whitlam had agreed to accept substantial sums of money for the election and that some of this money had not come through, thereby causing the present crisis. "Fischer told me that two Iraqi officials had come to Australiathe chief of Iraqi Intelligence together with a personal emissary of the dictator … [The] Arabs had asked for top-secret information on the Kissinger-Rabin and Kissinger-Assad talks, that Whitlam had arranged for them to receive this from a third party, a US citizen. Fischer also alleged that Whitlam gave them reassurances relating to [strongly pro-Israel ACTU president Bob] Hawke's prospects in the Labor Party." This was all potential political dynamite and Murdoch moved to check out who Fischer was and whether the Labor Party was paying its advertising bills. Although Murdoch's own file makes no mention of it, the now-released confidential papers of Fraser's Attorney-General, Bob Ellicott, show that the media magnate immediately rang the prime minister to seek verification of Fischer's story. Fraser has declined to speak about these events, citing poor memory, and he makes no mention of the affair in his recently published political memoir. However, Ellicott has recalled that Murdoch rang Fraser and the former attorney-general's files contain a memo, dated February 18, 1976, that records Fischer's allegations including that "meetings were alleged to have taken place in a flat belonging to a Mr Fischer, who is the managing director of the Reuben Scarf organisation in Australia, in a flat at Blue's Point Tower, Sydney". Fraser immediately began to search for information that could assist Murdoch. The Prime Minister called in the Secretary of Foreign Affairs, Alan Renouf, who in turn contacted the Australian Security Intelligence Organisation. ASIO confirmed that the two Iraqi officials had visited Sydney in the company of Fischer, though emphasising they had "no knowledge of their activities here or of the purpose of their visit". Renouf briefed Fraser and Ellicott who noted the advice "agrees almost completely" with key aspects of Fischer's story. By February 20 Fischer had flown to London and was interviewed at length by Murdoch who later recorded that: "At first [Fischer] stated categorically that $US500,000 had been passed over at that [December 10] meeting, but to the amazement of both the Arabs and Mrs Fischer, not even counted by Mr Combe. Under further questioning Fischer admitted that he had not seen the money itself, but only a very large, square envelope, which the Arabs later told him, contained half-a-million dollars." Murdoch remained in close contact with Fraser and arrangements were made for a senior Attorney-General's Department officer in London to sit in on Fischer's debriefing at News International. The precise extent of the information the government gave Murdoch is uncertain. However, Ellicott's confidential notes indicate that either he or Fraser confirmed details of the Iraqi officials' visit and provided other sensitive information including ASIO advice, derived from telephone interception, that Combe was about to embark on a holiday on a Soviet cruise liner (ASIO wrongly believed the trip was a freebie), and the information that "the log book of [Whitlam's Commonwealth] car indicates that the central figure in the issue was at the breakfast on the 10th [of December] at the Blues Point Tower." However, on February 24 Murdoch received an urgent message that the rival Melbourne Sun-Pictorial was about to publish a story by the journalist Laurie Oakes on the Labor Party's campaign debts and a promise of Arab money organised by Hartley and accepted by Whitlam. The News Limited chief swung into action. Hastily dictated and sent by telex to The Australian, Murdoch's front-page splash appeared under the headlines "Arabs in secret deal to pay ALP election bills" and "Whitlam tells Irakis Hawke won't be leader", and was attributed to "a special correspondent". Political pandemonium ensued after Murdoch's and Oakes's stories appeared. Under intense criticism, Whitlam contemplated resignation but was persuaded by colleagues to fight for the Labor leadership. Briefed by Murdoch on Fischer's allegations, Fraser provided background to press gallery journalists that Whitlam had received $US500,000 from the Iraqis. This was reported by The Australian and other News Limited papers. Although deeply embarrassed, Whitlam knew this was a false claim and launched defamation proceedings against News Limited. In Parliament, he made allegations of an improper political witch hunt when Ellicott called in the Commonwealth police to carry out an ultimately fruitless investigation of alleged foreign exchange regulation violations by the Labor Party. Murdoch provided a copy of his personal file to the police. This eventually found its way into the papers of Ellicott's successor as attorney-general, the late senator Peter Durack, and from there to the National Archives where it remained unopened for three decades. Whitlam survived the crisis and led the Labor Party until its defeat at the 1977 federal election. Most seriously for Murdoch, Fischer left London to fly back to Australia, only to disappear in Singapore and not resurface until years later as a far-right political operative in California. Murdoch was forced to settle Whitlam's defamation action. The terms of the settlement, negotiated personally by the media magnate and the Labor leader, have never been revealed but are understood to have included a six-figure payout. In 1990, a former Victorian editor of 'The Australian', Stephen Foley, and Marshall Wilson authored a book called, “Anatomy of a coup” in which chapter 15, 'The boys from Bagdad' told the story of the 'Iraqi Loan Affair'. Once these two versions of the events that took place from the 16th of November 1975 up to the end of February 1976 are properly examined, a completely different picture of what happened emerges and every Labor Party supporter should be very well aware of just what exactly happened to their political party. Gough Whitlam, the former Prime Minister, who the ALP executive in their minutes suggested that all players in this covert operation be sacked, but the minutes were shredded by Bob Hawke. Bill Hartley, a member of Victoria's 'Socialist Left' faction of the ALP, and a supporter of the Palestinians. 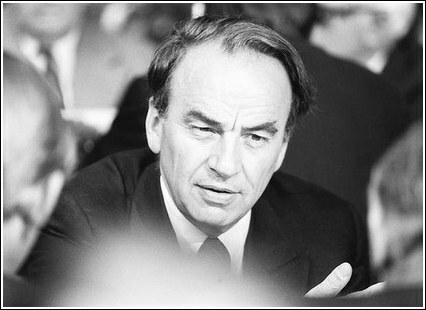 Hartley was expelled from the ALP in February 1986 after criticising Bob Hawke's passionate defence of Israel. David Combe, the National Secretary of the ALP who came to prominence in the 'Jobs for the Boys' affair with the KGB agent, Valeriy Ivanov, which led to Combe being sacked and then the Hope Royal Commission in 1986, which cleared the ALP of any wrong-doing which enabled Bob Hawke to appoint Combe as a 'Trade Commissioner to Vancouver'. He was later reassigned as Senior Trade Commissioner of the Australian Trade Commission in Hong Kong. Henry John Fischer, a Sydney businessman and the 'go-between' for Whitlam and the Iraqi government. Reuben F. Scarf, who employed Fischer and assigned him the task of raising funds in the Middle East (Iraq). Rupert Murdoch, the media mogul who broke the story in the Sydney based 'The Australian newspaper on the 25th of February 1976. “The Iraqi loans affair began when two Arabs accredited as members of the Iraqi Department of Foreign Affairs, identified as Farooq Abdulla Yehya and Ghafil Jassim entered Australia on 8 December from Tokyo. They were later presumed to have been Farrack Abdullah Yehya and Yassim Al-Tikriti although the discrepancy was never explained”. “Visas for the mystery visitors had been requested through the Australian Embassy in Tokyo, where the pair had declared 'discussions about the establishment of an Iraqi consulate' in Sydney to be the object of their visit. “Four days later Fischer flew to Bagdad where he was taken directly to meet Hadad. 'Mr Hadad seemed very pleased to receive Mr Hartley's letter concerning Mr Whitlam's request. He said he would immediately have a meeting with the president of the republic, Hassan Al-Baqr and the 'strongman' Saddam Hussein” (page 196) (Saddam Hussein became President on Iraq on the 16th of July 1979 when he led a coup against Al-Baqr). It was the Sydney based newspaper, “The Australian” that broke the story to the Australian people on the 25th of February 1976. Just how 'The Australian' was able to obtain the specifics of this story were never explained as Gough Whitlam, David Combe and Bill Hartley had never divulged their actions to any person outside of the ALP executive, and naturally none of those people would have informed the media. Thus, the only other possibility of this story being leaked would have to be Henry John Fischer, Rueben F. Scarf or the two Iraqis, Farooq Abdulla Yehya and Ghafil Jassim. “The discovery of Murdoch's personal file on the Iraqi Money affair and other records in the National Archives provides a unique insight into one of the more bizarre episodes in Australian politics” as only a partial explanation of this expose. Do not forget that Rupert Murdoch would have retained his own personal files of this event and they would have been available to the newspapers he owns which include 'The Australian'. The “Anatomy of a coup' state that the Iraqi Loans Affair started on the 8th of December 1975, with the arrival of two Arabs at Sydney airport, but again that is not correct. This affair was instigated prior to the national executive meeting of the ALP on the 16th of November 1975. Dorling states that it was Bill Hartley who raised the possibility of the funds from Iraq with the national secretary, David Combe at a national executive meeting held on the 16th of November, and even if David Combe agreed with that statement in his article in the Bulletin, it is not correct. Dorling also states Combe welcomed Hartley's idea and called over Whitlam who agreed that the left-winger should explore raising campaign funds in the Middle East, and again that is not quite correct. I would suggest that it was Combe who raised the idea with Hartley, on Whitlam's behalf, and once Hartley agreed, Whitlam then entered the conversation. “However, at Hartley's instigation Whitlam and Combe called on Fischer at his Sydney Blues Point Tower apartment in the evening of November 16 and it was agreed that the businessman would act as Labor's emissary in the Middle East.” The problem here is that the date of this event is that same date as the “ALP National Executive meeting, at which we are told that the matter of funds was originally raised. If Fischer had been Hartley's trusted associate, then Hartley would have accompanied his ALP associates to introduce them to Fischer. Since that didn't happen, then Fischer must have had other connections, neither to Hartley nor to Combe, but Fischer's connection had to be through Whitlam himself. Reuben F. Scarf has to be that connection. In his article, Dorling tells us that; that “meetings were alleged to have taken place in a flat belonging to a Mr Fischer, who is the managing director of the Reuben Scarf organisation in Australia, in a flat at Blue's Point Tower, Sydney”. If the Lebanese immigrant Reuben F. Scarf had been a 'spokesman' for the 'pro-Arab cause' as suggested, and as well had spoken to Whitlam in regard to entry visas for members of the PLO, then there would appear to be little reason for the matter to involve the Victorian based Bill Hartley. Again we are told that Reuben F. Scarf had assigned his 'managing director' to the task of raising money for the ALP in the Middle East, something that Fischer with his 'extensive Arab contacts' would have been capable of handling without Hartley's assistance. So for the 'agreement' to be made on the 16th of November 1975, by Whitlam and Combe that Fischer was to be 'their man' in the Middle East, then Whitlam must have surely been introduced to Fischer prior to making that decision, and with somebody Whitlam believed he could have trusted. That could only have been Reuben F. Scarf. With Henry (Henri) John Fischer meeting Whitlam and Combe at Fischer's apartment on the 16th of November 1975, The 'Anatomy of a coup' tells us that four days later, Fischer flew to Bagdad, which would have been on the 20th of November 1975, and then three days later Fischer met Saddam Hussein, which would have been on the 23rd of November. Fischer apparently passed on the news of his meeting and its success via his wife. However, what we are not told is when Fischer returned to Australia. The 'Anatomy of a coup' tells us that the two Iraqi emissaries arrived at Sydney airport from Tokyo on the 8th of December where they were met at the airport by John Fischer. Also to greet the Iraqis as protocol requires, was an Australian diplomat from the Department of Foreign Affairs, and of course ASIO, who closely 'monitored' the two Iraqis, which simply means that Fischer's presence would also have been noted. Dorling's article tells us that Fischer returned to Australia in the company of the two Iraqi officials. Whichever of the two versions is correct, the arrival of the two Iraqis and their connection with Fischer would have been duly noted Dorling tells us that Whitlam and Combe met the Iraqis at a breakfast meeting at Fischer's apartment on the 10th of December, three days before the Federal election. Dorling also tells us that “no funds changed hands at the meeting”. The 'Anatomy of a coup' gives us the time and date of that call from Fischer to Combe. The Lies. Truth is normally very constant. What we have to look at within these paragraphs are statements that are not constant. (a)	Fischer's statement is the only available record of what transpired. (b)	According to Combe in a 1982 Bulletin article, no money was handed over at the meeting. Clearly, there was another statement, that made by Combe that conflicted with what Fischer stated occurred at the breakfast meeting. (d)	“Fischer accompanied the Iraqis to Hong Kong, during which he was told by Al-Tikriti through Yehya, the interpreter, that the package handed to Combe had contained half a million dollars and that a similar sum would be forthcoming.” In paragraph (c) Fischer clearly tells us that Al-Tikriti could speak English and did so to Gough Whitlam, but then Fischer tells us in paragraph (d) the Al-Tikriti required the use of an interpreter, Yehya. But the lie gets even bigger! Combe and Whitlam had only sought a donation of $500,000, and according to Fischer this amount was given to Whitlam via Combe at the breakfast meeting but then Fischer says that another similar amount would be forthcoming! If this was factual, then why didn't the Iraqis give the full donation to Whitlam at the breakfast meeting? Again, if any money had been handed over, then why did Fischer make the telephone call to Combe on the evening of the 10th of December informing Combe that the 'funds were forthcoming'? Furthermore, if the 'funds' had been presented to Whitlam, then why did Fischer accompany the two Iraqis out of Australia to Hong Kong? Firstly, there is no evidence whatsoever that Fischer was in a precarious financial situation. Secondly there is no evidence to suggest that Fischer diverted any funds to himself. Thirdly, had Fischer subsequently acquired property in California using stolen Iraqi funds, then there would be a trail of where the money used to buy that property came from. So let me make this statement quite emphatically; there were never any funds coming out of Iraq to assist the ALP. No such money was ever seen! Not even by Fischer! No money was ever received! Not even by Fischer! Ergo, such monies never existed! If there were no funds to be presented to Whitlam and Combe, then this event was a 'sting' a set up, to put Whitlam in an extremely precarious situation. Again, if there was no money, then who were the two men posing as emissaries from Iraq? No money means that there would not have been any emissaries from Iraq, so just exactly who were these two men and where did they come from? These two men entered the scene in Tokyo, and exited the scene in Hong Kong. They could have come from anywhere, from Beirut, from Damascus, from Gaza, or from Tel Aviv. The one place they did not come from was Bagdad. No funds means they did not come from Bagdad! And just exactly who was Henry John Fischer who created this deception to destroy Gough Whitlam and David Combe? The last recorded sighting of Henry John Fischer in Australia was on the 10th of December 1975. We are told that Fischer flew out of Australia to Hong Kong in company with the two Iraqis. There is no mention of Fischer's subsequent return to Australia. What we must realise is that there was never any 'first instalment' to begin with so this statement is false. Furthermore, Fischer never states who ordered him, or authorised him to return to Bagdad. So what happened in February? Interestingly Dorling tells us: “However, Ellicott has recalled that Murdoch rang Fraser and the former attorney-general's files contain a memo, dated February 18, 1976, that records Fischer's allegations including that “meetings were alleged to have taken place in a flat belonging to a Mr Fischer, who is the managing director of the Reuben Scarf organisation in Australia, in a flat at Blue's Point Tower, Sydney”. [So just how much time did Rupert Murdoch spend verifying the information he had received from Fischer before leaping into action and contacting the Australian Prime Minister? Just how could Rupert Murdoch have verified such a story? There were only three sources to verify the meeting at Fischer's apartment; (1) the Fischers, (2) Whitlam or Combe, and (3) the two Iraqis. This is extremely simple to understand. For Rupert Murdoch to act on what he was told by a 'complete stranger' Murdoch would need some form of corroboration of Fischer's story. Murdoch cannot ask Whitlam or Combe, so the only other source of Corroboration has to be the 'two Iraqis' who were at the meeting. The only other possibility was that Fischer was not a 'complete stranger' to Murdoch! Now ask yourself one very simple question; “Why would an extremely 'anti-Zionist' person, to wit, Henry Fischer, and two equally 'anti-Zionist' Iraqis inform one of the world's most known Zionists (Murdoch)? [Now ASIO is not stupid. When the two Iraqis landed at Sydney airport, with visas obtained from Tokyo, they would have done some study on just who these Iraqis were. If Farooq Abdulla Yehya was the Chief of Iraqi Intelligence as Fischer told Murdoch, then ASIO would have spotted that and would have become extremely interested in Yehya's activities in Sydney, and they would have been aware of the breakfast meeting with Whitlam and Combe, especially as Fischer was a 'known' PLO sympathiser. However, if the two Iraqis were unknown and simply listed as diplomats from the Iraqi Department of Foreign Affairs, and an Australian equivalent had met the two Iraqis, then ASIO would not have been too concerned. [What Dorling is telling us is that Murdoch rang the Australian Federal government and spoke to Malcolm Fraser. That is one telephone call. Murdoch must have given information to Fraser in regard to what he was 'told' by Fischer. Fraser would have required some time to check out that information. However, it must be considered rather dubious that Fraser would have passed on further information to Murdoch. [What must be totally understood from the interviews Murdoch did with Fischer, it was made extremely clear that there was no evidence of any money being passed on to Whitlam or Combe at Fischer's apartment on the 10th of December 1975, and Murdoch was very well aware of that fact well prior to his composing the article that defamed Gough Whitlam. So the question has to be asked as to why Rupert Murdoch deliberately defamed Whitlam in suggesting that the money was passed onto Whitlam, when Murdoch was well aware that the allegation could not be substantiated. However, it was in the second article written by Rupert Murdoch, “Whitlam tells Iraqis Hawke won't be leader”. This same claim was made in 'Anatomy of a coup' and apparently in David Combe's article in the 'Bulletin' of 1982. Bob Hawke was at the time president of the ALP and of the ACTU. There were never any suggestions whatsoever that Hawke would become a politician. For 'the Iraqis' to ask such request from the ALP parliamentary leader must also be considered ludicrous, but then consider what expired over the next seven years. Gough Whitlam remained the ALP parliamentary leader until the 1977 federal election which the ALP lost and finally Gough got the message and retired. Bob Hawke was then persuaded to become a politician and was given the 'Blue Ribbon' Labor seat of Coburg which he duly won at the next election, and then just prior to the 1983 federal election, Bob Hawke replaced Bill Hayden as the parliamentary leader, and of course the rest is history. [I believe that we can take as fictional any reference to Henry John Fischer and California. What is relevant is that Fischer disappeared along with the two Iraqis, which simply means he would not have been available for any proper investigation into the 'Iraqi Loans Affair'. “Whitlam's policy of even-handed neutrality in the Middle East created divisions during his Prime Ministership with the party presidency. Hawke's pro-Israeli sympathies frequently brought him into open conflict with Whitlam, whom he accused of being intolerant of dissenting views. The Jewish community was alarmed that the prime Minister had abandoned an historically bipartisan policy towards Israel. They denounced the treatment in Whitlam's memoirs of the period following the outbreak of the Yom Kippur War as 'an attempt to re-write history'. Jewish leaders, concerned that Israel would be overrun by the Soviet-equipped armies of Egypt and Syria, sought Whitlam's support in convening the UN Security Council, then chaired by Australia, in an effort to achieve a ceasefire. Whitlam offensively described the delegation as 'heroes' who were trying to blackmail him and refused to see all but two of its members. [So, from 1973, Whitlam's 'even-handed' Middle East policy had offended the Australian-Jewish community, and thus they would react in some manner. How would the Australian-Jewish community react? Well, for a start, they would stop supporting the ALP, and they would also withdraw any donations made to the party, as well as upping their support for the opposing Liberal party. “Scarf employed Fischer, who had extensive Arab contacts, and assigned him to the task of raising money for the Australian Labor Party in the Middle East. Cash was urgently needed to fight the 13 December election.” (page 191) In other words, it was Reuben F. Scarf who would have told Whitlam not to worry about the Jewish donations as we Arabs have the petro-dollars and are also very wealthy, and Whitlam fell for it. Gough Whitlam's policy of 'even-handedness neutrality in the Middle East has left a lasting phobia within the Australian-Jewish community that support for the PLO could be rekindled. In 2003 such fears were evident. Simon Crean's appeal didn't save him as Leader of the Opposition. There was talk within the ALP to move the NSW Premier, Bob Carr into the Federal arena to become the ALP Federal Parliamentary Leader, but Carr was not interested. Crean was replaced by Kim Beazley, who in turn was replaced by Mark Latham, who was replaced by Kevin Rudd, who eventually became Prime Minister in 2007. AUSTRALIA has abstained from a key UN vote supporting a war crimes investigation of Israel's military assault on Gaza last year, three months after voting against the resolution. Foreign Minister Stephen Smith said yesterday the decision was unrelated to "recent events", a reference to Canberra's anger at Israel's failure to explain the use of three Australian passports by suspects in the murder in Dubai of a senior Palestinian militant. On Friday, the UN General Assembly considered a follow-up resolution to the Goldstone report on the Gaza conflict, which was passed with 98 countries voting in favour, seven against and 31 abstaining. Australia is traditionally one of Israel's strongest supporters at the UN, and Canberra denied its decision to abstain was related to the passports affair. THE expulsion of a diplomat from Israel's Canberra embassy is a significant over-reaction to Mossad's alleged involvement in the January assassination of a Hamas terrorist. What happened is well known: Mahmoud al-Mabhouh, an arms purchaser and fixer for the terrorist organisation Hamas, was executed in a Dubai hotel by a large group of assassins using forged passports from several countries. Dubai authorities have pointed the finger at Israel's intelligence agency. The issue that caused Foreign Minister Stephen Smith to order the expulsion wasn't the assassination but the forgery of four Australian passports, which government agencies investigating the affair claim was almost certainly carried out by Israel. Australia is following Britain, which expelled an Israeli diplomat in March. Yet Smith has already called in Yuval Rotem, Israel's ambassador, for a dressing down, as well as changing the way Australia traditionally votes concerning Israel in the UN. On the 24th of June 2010, Kevin Rudd was removed by the Labor Party as their Parliamentary leader, and his deputy, Julia Gillard became Prime Minister. At the 2010 federal election the ALP retained power via a minority government with the help of the Greens party and three Independents. Kevin Rudd was given the 'portfolio of 'Foreign Affairs'. However, the Gillard government stumbled along and continued to fail in its bid to gain popular recognition. Then on the 19th and 21st November 2011, the articles by Philip Dorling appeared in 'The Australian' newspaper returning to the 1976 Whitlam and the Iraqi funds Affair. On the 30th of November the Parliament went into recess for the Christmas break, and was not scheduled to resume until the 7th of February 2012. On the 5th of February 2012 the ALP held a 'special caucus strategy meeting' which was followed by a barbeque at 'The Lodge'. This is how the ABC reported this event. 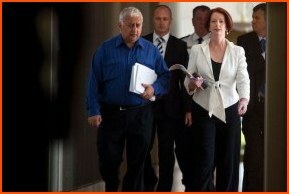 Julia Gillard has told MPs to be more disciplined. [ABC] Last Updated: Sun, 5 Feb 2012 22:43:00 +1100. The Australian Prime Minister has called on Labor MPs to show more internal discipline this year, as speculation about her leadership and a possible challenge from Kevin Rudd continue to stalk the party. Julia Gillard told a special caucus strategy meeting that a lack of discipline only helped the Liberal Party and that no-one joined the ALP to do that. A caucus spokesman says three or four MPs later rose to agree with the Prime Minister that backgrounding journalists was not helpful. He said Julia Gillard told Labor MPs that tough decisions made in 2012 had led to some political pain but that in 2013 the results of those decisions would be evident. In particular, she mentioned the tax cuts and increases to welfare payments associated with both the carbon pricing scheme and the mining tax which come into effect on July 1. The spokesman says the leadership speculation was mentioned only in the context of showing discipline and not talking to the media and that Kevin Rudd's name was not mentioned. Mr Rudd could not attend the meeting because he is overseas. This evening MPs gathered at the Lodge for a barbeque and continued discussion about the year ahead. What the phrase; 'speculation about her leadership and a possible challenge from Kevin Rudd continue to stalk the party' means is that this speculation emanates mostly from the media and not from within the ALP. Again, we are told that Kevin Rudd's name was not mentioned as he was not at the meeting, being overseas, and that would be fairly accurate. However it would have been at 'The Lodge' where MPs gathered for a barbeque and continued discussion about the year ahead, that the events for February would have been planned. Kevin Rudd would be the sacrificial goat, and with his removal, all the ills from the previous years' incompetency, lies and self-centred policies would be removed with him. However there was still needed a strong ALP leader to replace Julia Gillard should this tactic not work, and as in 2003, the ALP looked to the former NSW Premier, Bob Carr to fill that role, and again, this strategy would have to have been properly worked out prior to the actual event. Please remember that a similar strategy was tried in 2003 when Simon Crean was to be replaced due to his failure to control the 'Socialist-left' backbenchers, but Bob Carr dismissed the strategy as he was still Premier of NSW at that time. So it is Simon Crean who attacks Kevin Rudd, as Crean is very well aware that not only did he lose the parliamentary leadership of the ALP, but the ALP lost the 2004 election due to the pro-Palestinian 'Socialist-left' backbenchers. Simon Crean does not want the ALP to lose the 2013 election due to Rudd's failure to vote at the UN in the 'traditional' manner. There is now the method required to move the former NSW Premier, Bob Carr into the federal sphere, and this move is reminiscent of the Whitlam moves to replace the Queensland DLP senator, Vincent Gair in 1974. It would have been too risky to have Carr endeavour to gain a lower house seat by contesting a by-election and the NSW Senator Mark Arbib was induced to retire so as to have his seat offered to Bob Carr. So, up until the 20th of February, Julia Gillard is still dismissing the possibility of a 'leadership challenge' whilst Simon Crean and company are stirring the fires of revolt, but on the 21st, Kevin Rudd responds and resigns from the position of Minister for Foreign Affairs, and again, please note that Kevin's position has not changed one iota since he lost the Prime Ministership, his backers remained at about 31 to Julia's backers of 71. So Rupert Murdoch and the 'Australian-Jewish' community have gained the position they desired. Kevin Rudd, who caused the Australian vote at the UN to be repositioned, and then expelled an Israeli diplomat over the assassination of a Hamas leader in Dubai has been removed to the back benches and will never again threaten the position of Israel. To Zionists, nothing else matters.